A less than fruitful mix of TV show and video game, where although the individual components are competent they're never quite interesting enough to justify the peculiar set-up. 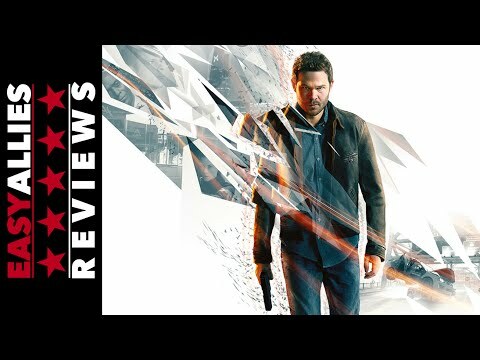 Quantum Break looks slick, but bouts of ineffective gameplay and its mixed-media construction make this a hit-and-miss experience. Despite how pedestrian some aspects of the game may be, I concluded Quantum Break feeling like something new had happened. Something special had happened that more than compensated for some of the flatness of the story and the mostly rote gunplay. A game simply never worked like this before, nor has a TV show. Because of that, what might have otherwise been ordinary feels extraordinary. A bold experiment in marrying passive and interactive elements to create a narrative game, Quantum Break almost succeeds. It looks utterly stunning, and it's fun to play, but overall the game doesn't quite gel with its TV show-style episodes to elevate its experience into something new. What we're left with is an enjoyable game and a half-decent TV show that coexist together, but don't feel like they're fundamentally entwined. Quantum Break won't at all times feel like a game, as the player spends a fair chunk of time relegated to spectator. But, no matter which side Quantum Break is showing, it's always going to be a spectacular one. Quantum Break is an engaging and enjoyable narrative experience, and it makes the most of its stellar cast, pushing the boundaries of storytelling in games and presentation. However, it won't be for everyone, particularly those who don't like to be led by the hand or don't want to spend an extended amount of time watching content rather than interacting with it. It also falsely makes you feel like you have a choice, but then, that's much of its point, and despite a few missteps this is a story well worth experiencing. This is a genuinely new experience, and I'm beyond glad that Remedy took this bizarre risk and made it. This is a game that feels special, new, and worth trying. I doubted this thing, I really did. But damn if it didn't get me in the end. At one point, Paul Serene emphatically states that the timeline is set, and that the advent of time fracturing and collapsing on itself can't be avoided. There is only one reality, he argues. If Quantum Break is a game fractured between two worlds, the one reality set for us as players is the one in which it's a shooter that often isn't a shooter, and a story that doesn't fully explore its narrative potential. It has intriguing ideas regarding both, but in this case, two halves don't really make a whole. Quantum Break has some breathtaking moments and shoot outs, but its mechanics are a bit shallow and the story not that strong. Quantum Break arrives to PC completely unaltered, with all its lights and shadows, but offers an improved visual experience by exploiting the highest hardware configurations & an enhanced control system thanks to the inclusion of the mouse. Sci-fi story lovers should buy. Everyone else should rent or try it later.